While the salads and raw dishes are common in a vegan diet, it is almost impossible to avoid cooking grease altogether. From leftover frying oil to coconut oil, we don’t always think twice before rinsing our pots and pains over the drain. It’s a common habit for us to rinse our pans, and along with them, rinse the cooking grease straight into the drain, but is this really that bad? While we may have never asked ourselves this question, rinsing cooking grease in your sink, whether it’s from frying, sautéing or roasting vegetables, is in fact a problem with terrible and expensive consequences. In the same way fat and cholesterol block our veins and arteries, fat in drains leads to blocked pipes, sewer blockages in municipal lines, and costly sewage backups in your home and the environment. Rinsing cooking grease with hot water doesn’t help either. Cooking grease will quickly cool and congeal in the pipes. So, what is a healthy, vegan cook do? Below are some easy and affordable methods for getting rid of cooking grease in a safe, responsible, and creative way (some are even tasty!). But before you check out these cooking grease solutions, first learn how to limit how much fat you use to begin with. Using less fat while cooking means fewer calories in your dish and a lower grocery bill—because your cooking fats will last longer. Here are some easy ways to use less fat while cooking. In lieu of deep frying, roast or broil food in the oven, shallow-fry in a pan on the stovetop, or fire up the grill. 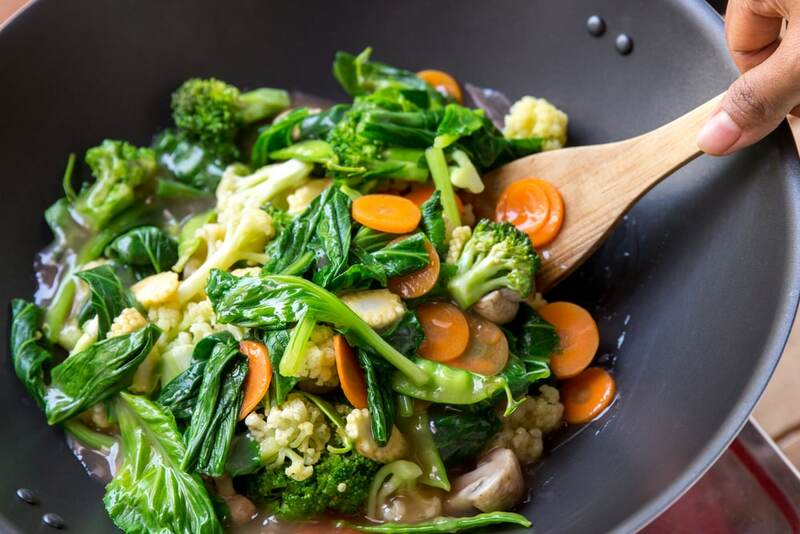 When sautéing, decrease the amount of fat your recipe calls for (use a teaspoon instead of a tablespoon). Replace oil with small amounts of water. Add a little at a time to keep food moving and browning in the pan without steaming. Always measure fats instead of free pouring them. Steam veggies instead of sautéing them. Here are some easy and cheap alternatives to getting rid of cooking grease in a safe, responsible, and creative way. Glad I decided to read this article because I’m always looking for resources to share with clients to help them eat better. Grilling, roasting and broiling are my favorite cooking methods. Fantastic article! I work for a municipal water department and Its really important to educate people about the disastrous effects of pouring fat, oil and grease down the drain! When I was younger and first got into cooking, I had a bad habit of pouring grease down the drain when I was done. This soon stopped when my mom caught me and explained what would happen to our pipes! I always make sure to dispose of cooking oil properly, or use it in recipes now. Thanks for the tips!